Using your Lexmark C912 is quick and easy as the Lexmark C 912 has been specially designed to ensure that printing is a simple and painless process. The Lexmark C912 is capable of producing up to 28 pages per minute which can be useful but always using your C-912 can lead to a giant bill as the black Lexmark C912 toner cartridge, for example, is pricey. The C 912 toner cartridges as well as other Lexmark C912 accessories can be expensive-try comparing Lexmark C912 toner prices to find out. Luckily, we at CartridgeSAVE have made it our mission to ensure that you get the Lexmark C912 cartridge for as cheap as possible and we also supply you with great service to ensure you get the most out of your Lexmark C912 toner cartridge purchasing experience. The C912 toner cartridge is available to order immediately from our secure server which ensures you can get the Lexmark C912 cartridge with as little trouble as possible. The Lexmark C 912 cartridge is available with free delivery as well, so you get the best value for money on all your Lexmark C-912 toner needs. We want to inspire confidence when you order the Lexmark C912 toner cartridge so every Lexmark C912 cartridge comes with a money back guarantee so you know that you will receive a top quality genuine Lexmark C-912 toner cartridge every time. Small yet powerful, the Lexmark C912 is a colour laser printer designed for small offices. This unit delivers high-quality images and documents and even photographs. It can handle media such as banner paper, envelopes, card stock, transparencies, and labels. The Lexmark C912 colour laser printer has a 128 MB memory that can be expanded to 512 MB and runs on a 600 MHz processor. This compact unit has an impressive monthly duty cycle of 100,000 pages. Networking connectivity is not standard to the unit. The Lexmark C912 colour printer has a box-like shape and measures 20.2 x 27.4 x 25.8 inches. It weighs 177.1 lbs and it can handle a maximum of 5,300 pages. Print speed can go as fast as 28 ppm for coloured and black and white letter-size output with the first page coming out in 15 seconds or less. The speedy Lexmark C912 wide-format colour printer has an output capacity of 650 upgradable to 1,650. A USB port as well as a small control panel is available. Original Lexmark C912 toner cartridges can print approximately 14,000 pages per colour. 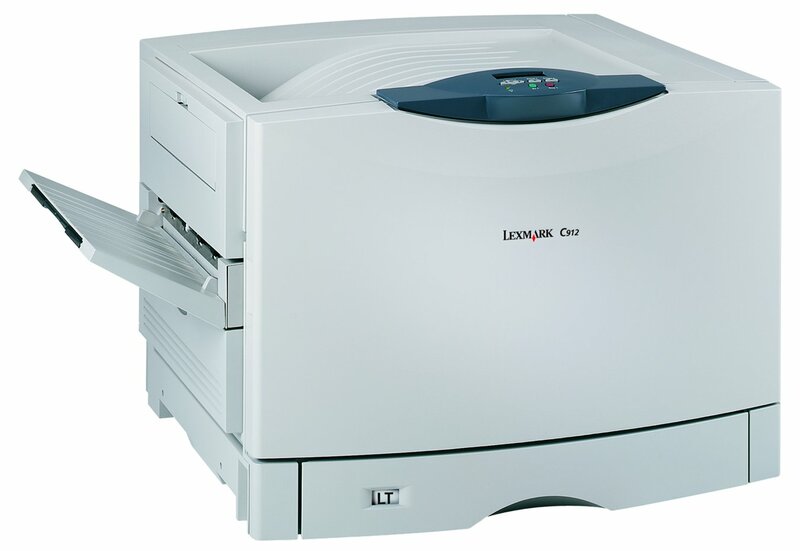 Both Macintosh and Windows as well as Linux users are be able to access the Lexmark C912 colour laser printer. This unit has a small footprint and it does not require regular or frequent maintenance. The Lexmark C-912 colour printer is quite robust and is very reliable, delivering consistent and high-quality output. Print resolution can go as high as 2,400 image quality. The Lexmark C912 printer could be better if the automatic duplexer and networking connectivity were standard to the unit. It could also use a USB host for direct printing.